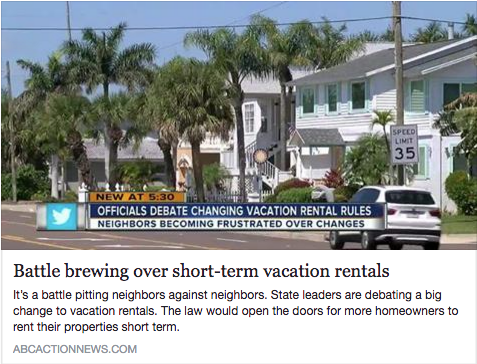 In 2014, the Legislature passed SB 356 (Thrasher), which diminished the preemption on short-term rentals. The law allows local governments to adopt ordinances specific to these rentals so that they can address some of the noise, parking, trash and life-safety issues created by their proliferation in residential neighborhoods. Unfortunately, SB 356 left in place existing statutory language stating that cities cannot “prohibit” short-term rentals, or regulate the duration or frequency of the rental. Our local city ordinance will be grandfathered in even if these two bills pass. The problem is the new legislation will make it easy for the state government to get rid of the grandfathered city ordinances in the future. The city of Clearwater has told us that our current ordinance is already hard to enforce. The next step is to find a way to make sure we can change our current ordinance to become stronger without the state law affecting it or considering it null and void. If these bills pass than it will stop the city from being able to change its current ordinances on short term rentals. With the influx of new hotels we need to make sure they get filled and not our neighborhood with tourists. This is bad business across the board for everybody. I am urging everyone who receives this message to reach out to everyone on this next committee to share your feeling about these bills and how it will affect your way of life. Below are two links. The 1st one is the homepage for the Florida Senate. On that page you will see a search toll near the top area where you can pull up a bill by its number or by key words. Also there are tabs that will let you search the various committees and the list of individual senators. You can even track bills (upper right side) that will send you email updates if there is any action on your item. The 2nd link is directly to the Senate’s Regulated Industries Committee page. This is the committee at which SB 188 will be heard on Tuesday. Remember calls to these committees and emails are needed. The last line of defense if this gets passed through the next committee is Senator Jack Latvala (727) 793-2797. His aid is Richard Reidy who was very helpful and is setting up a meeting with me, city officials and Latvala. Richard is who you will reach when you call senator Latvala. It will still be good to let them hear from each and every one of you now. Richard was the one who said e-mails and calls help give pressure to the situation. Another senator that must be contacted is Senator Jeff Brandes District Office (727) 563-2100 and Tallahassee Office (850) 487-5024. There are many personal feelings you may have about this situation and the future of our area. See also attached in this email the longer version and detailed explanation of the growth of short term rentals and its effect on communities and business as well. Some talking points and reminders of this attachment and what happens when short term rentals get out of hand are listed below to help you with your e-mails and calls. In areas where short-term rentals are situated, many neighboring residents complain about the noise generated by the vacationing renters next door. When people go on vacation, often their behavior changes. They may stay awake later, consume more alcoholic beverages throughout the day, or participate in recreational activities that they would not participate in while at their own homes, such as swimming at midnight with music blaring. For those homes located near water, a lake or the ocean, it is important to note that sound travels easily over water – and residents located hundreds of yards away may be the ones calling and complaining to the police and their local elected officials. The constant turnover of renters creates a number of issues for cities and neighboring property owners. Prior to the preemption, local governments were able to regulate this activity through zoning. Short-term rentals have become increasingly popular in the last five years. Because a city cannot “prohibit” these properties, they are powerless to exclude them from residential neighborhoods. As a result, investors, many of whom are located out of state or even in a different country, have purchased or built single-family homes with the sole intent of turning them into short-term rentals. People have moved out of such areas as it has lowered property value and decreased the quality of life for their families. City officials are teaming up with transportation officials to give visitors a break when enjoying spring break. 50 cents an hour up to a $5 maximum. Free parking after 6 p.m. and on weekends. Those riding to the beach will be dropped off at the Clearwater Beach Marina. The “Park & Ride” program will operate throughout the spring break season, Feb. 24 through April 30. Get all the information you need by visiting trafficsabeach.com. The Clearwater Ferry will also be operating in full steam, adding extra boats to speed up wait times and get visitors back-and-forth between downtown and the beach faster. The ferry will be operating a separate vessel specifically for transporting Clearwater Beach employees to cut down on the amount of vehicles and traffic on the island. Get prices, travel times and drop-off and pick-up locations at clearwaterferry.com. Clearwater Beach’s newest parking garage, the Pelican Walk Parking Garage, is also open offering more than 400 new parking spots for visitors. Cost of parking in the garage during the spring break season will be $2.00 an hour. We are all looking forward to hearing from our guest speaker this month, Thomas Paterek, the Chair of the Suncoast Chapter of the Surfrider Foundation. He will be discussing the organizations history and RAP, their “Rise Above Plastics” program. RAP was created to eliminate the impact of plastics on the marine environment through educating about the dangers of plastic pollution and by advocating a reduction in certain plastics. The more we talk about this topic, the more we will see actual change! We all care deeply about our beautiful beaches, and RAP is here to help us all be active in creating a positive solution. Please join us on March 7th, 6:30PM, at Chapel-By-The-Sea! The warmer weather brings the crowds. 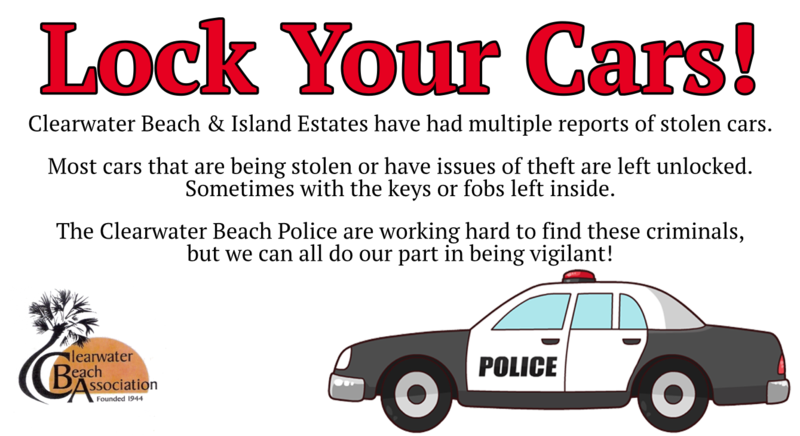 Don’t forget to lock your cars!! WATERWAY & LOCATION: The project would affect waters of the United States associated with Mandalay Channel in Clearwater Harbor. The project site is located waterward of 627 Bay Esplanade, in Section 05, Township 29 South, Range 15 East, Clearwater, Pinellas County, Florida. PROPOSED WORK: The applicant seeks authorization to install a 4-vessel Mooring Field in Mandalay Channel. A public notice for the proposed project was previously published on September 15, 2016. As a result of the comments received, the proposal was revised from 42 vessels to 4 vessels. The revised proposal includes regulatory buoys to mark the boundary of the 4-vessel Mooring Field to preserve more than 50% of the channel for free navigation and recreation. The proposed Mooring Field will occupy approximately 8 acres of privately owned submerged lands and will accommodate boats up to 70 feet in length. Water depths within the Mooring Field range from approximately 7.5 to 12.0 feet at mean low water. All vessels utilizing the facility will be required to have a minimum of one foot of clearance between the bottom of the vessel and the substrate within the project area and navigational channel. 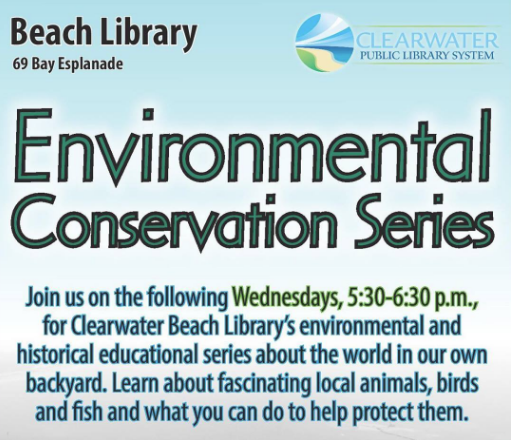 Friends of Clearwater Beach Recreation/Library, Inc. is proud to announce that the Environmental Conservation Series is underway. Mark your calendar for the following dates, from 5:30-6:30, at the Beach Library/Recreation Center. We look forward to seeing you there. Private sponsors, businesses, and CBA have contributed to speakers’ costs, recyclable bags, coupons, and gifts. 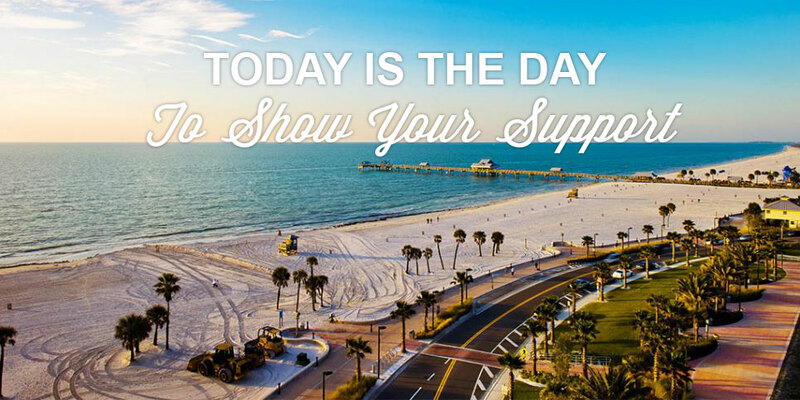 If you would like to help Friends of Clearwater Beach Recreation Center/Library, Inc. financially, physically, or otherwise, please be sure to contact us at friendsofclearwaterbeach@gmail.com. The Friends of Clearwater Beach is kicking off their Environmental Conservation Speaker Series this Wednesday, September 14th from 5:30PM – 6:30PM at the Beach Library (69 Bay Esplanade). The first speaker is none other than our favorite long-time local ANNE GARRIS! Anne will be discussing the History of Clearwater Beach’s early beginnings and evolution over the years. 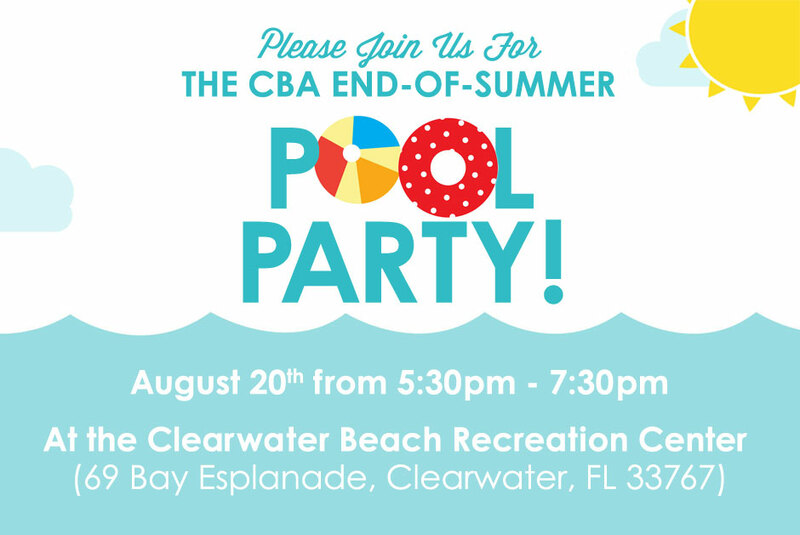 Come celebrate the end of a great summer with your CBA Family! This summer has been HOT, let’s get together and cool off! Please bring an appetizer to share. CBA will supply beverages and Nature’s Food Patch will be donating some great stuff too! *There will be two lifeguards on duty and no alcohol will be permitted. Emergency Meeting tonight at 6PM! We hope to see everyone tonight at 6PM to discuss the one-way proposal. All are welcome! 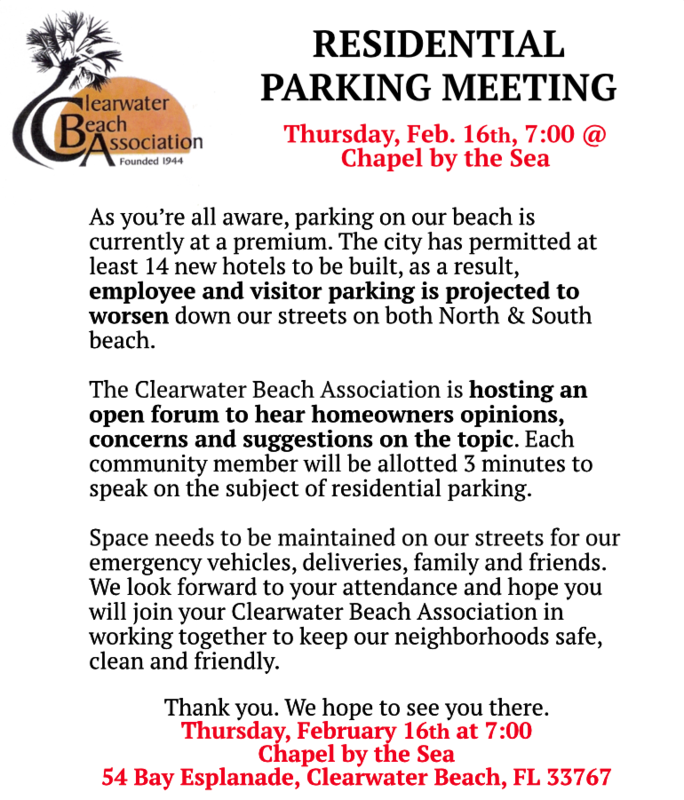 Meeting will be held at Chapel-by-the-Sea (54 Bay Esplanade).